Introducing the Russian breakthrough in sports performance nutrition! Meet ECDY-BOLIN. Developed in Russia, TrulyHuge.com brings you this cutting edge dietary supplement. Studies conducted in the Soviet Union in 1988 showed ecdysterone helps "increase hepatic protein synthesis and subsequently promote positive nitrogen balance!" How does this lead to more muscle mass? Simply: "the more nitrogen your body maintains and the greater rate of protein synthesis, the more muscle mass." How does ecdysterone do this? V. Smetanin, researcher of the Smolenk State Medical Institute in Russia speculated that ecdysterone decreases urea concentration in the body and increases hemoglobin levels by increasing a process called erythropoiesis. Erythropoiesis is the development of mature red blood cells. This leads to a stimulation of the anabolic process in protein metabolism, which in turn leads to a positive nitrogen balance in the body. The most often quoted ecdysterone scientific study was published in Scientific Sports Bulletin by S. Simakin in 1988. The objective of Simakin's famous study was to determine the effect of ecdysterone on muscle tissue mass and fat mass, while testing for hormonal changes in the subjects. For the study, three control factors were used: a placebo, protein, and ecdysterone with protein. The results were significantly in favor of the third factor. Of the 78 highly trained male and female athletes who consumed just protein, they showed only a slight increase in muscle mass for the 10 day period of time. Those who used a placebo lost a slight amount of lean muscle, while those who used protein plus ecdysterone showed a 6-7% increase in lean muscle tissue with nearly a 10% reduction in fat! Let me say that again: A 10% reduction in fat and a 7% increase in lean muscle tissue in just 10 days! Safety testing was conducted during the same time period which showed no difference in hormonal balance. Ecdysterone was tested in another study performed in 1986 by B.Ya Smetanin. For this research, 117 highly trained speed skaters between the ages of 18 and 28 were tested for work capacity, body weight, lung capacity and VO2 max. The results speak for themselves: all of the said parameters increased as well as an increase in the O2 pulse max and an increase in the exhalation of CO2. Basically, they received more oxygen to their cells! This equates to decreasing recovery time, maximizing performance, permitting optimal muscle anabolism and maximum fat reduction. It also means the athletes using ecdysterone compared to those on a placebo experienced increased stamina, endurance and energy. Each capsule contains 100 mg of pure Beta Ecdysterone. Other Ingredients: Rice Flower, Magnesium Stearate, Gelatin (Capsule). I have done hours upon hours of research on this origionally Russian Product, and I have purchased what was promissed to be real Russian Leuzea carthamoides which the actual plant product which comes from, when I received the product I took it for 4 weeks, like work clock work every day. Needless to say it was ALL ad hype, it did absolutely nothing. Nothing has worked better, than the products I've purchased through your site, they have all worked out well for me ESPECIALLY the ECDYSTRONE, it rocks! 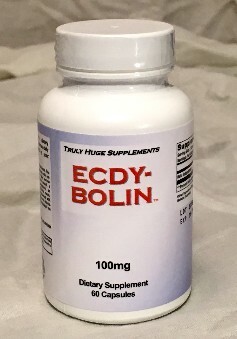 The Ecdy-Bolin product from your company was superior to products that I've personally used that claim to have the same ingredients but cost 3 to 4 times the price you are charging. Ecdy-Bolin is the best and is getting me measurable results in a matter of only 2 weeks. Make it a great day and if you want to use my picture in promoting your product feel free my brother!" A $20 value, absolutely FREE! Buy ecdysterone an herbal, legal anabolic, steroid replacement for muscle growth and fat loss.